7/8-length trousers "Wash & Go" by KJBRAND. 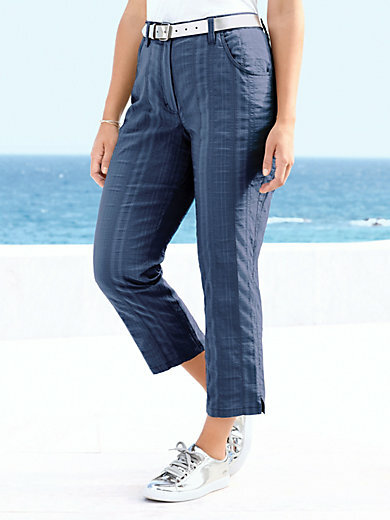 Design BEA with comfortable waist and tapered leg. With 2 pockets on the front, belt loops and side hem vents. Belt not included. Inside leg length in regular sizes approx. 24ins., in short sizes approx. 22ins. Ankle width approx. 15ins. Wash, dry and you’re good to go as these great, easy-care care designs don’t need ironing! Skin-friendly cotton, cooling viscose, the finest, shape-retaining polyester and flexible elastane ensure supreme comfort. 47% cotton, 45% polyester, 6% viscose, 2% elastane. The 7/8-length trousers are machine washable.